Your Reaction: What did you think of The Nutcracker 2017/18? Audience responses to The Royal Ballet's Christmas classic. Sarah Lamb and Steven McRae’s performance as the Sugar Plum Fairy and the Prince was the perfect icing on one already perfect cake. Musical suites and magical sweets ???????? #ROHNutcracker is an absolute cracker of a show ???? #ROHnutcracker such incredible performances in every area, what a night! Completely faultless! 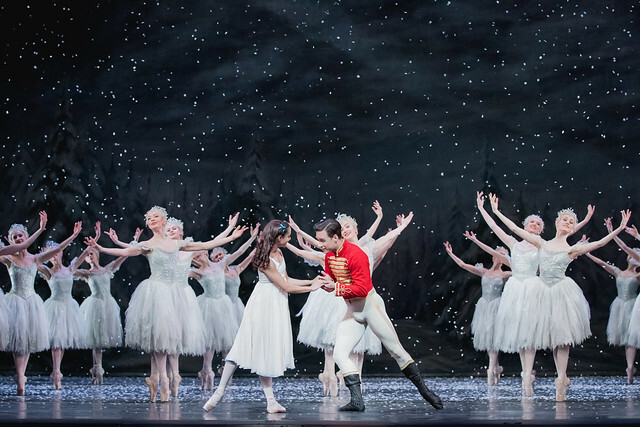 What did you think of The Nutcracker? 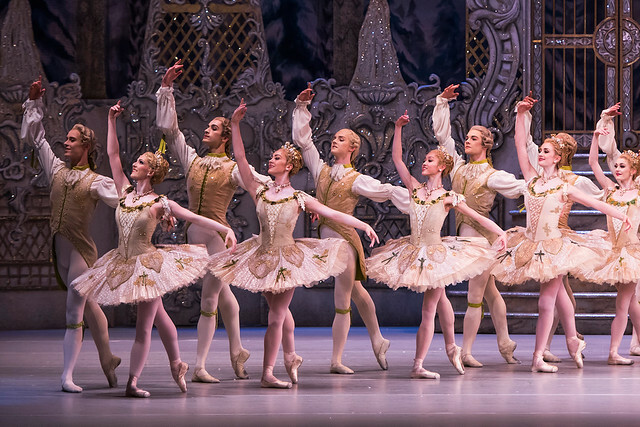 The Nutcracker runs until 10 January 2018. Tickets are sold out, although returns may become available. A limited number of tickets are released each week as part of Friday Rush. World class ballet - absolutely phenomenal - whisked to a magical place - stunning from costumes , dancers ,the ballet itself - even the sound of ballerinas blocks as they go off stage !Running out of superlatives !! Enjoyed it immensely. Was disappointed not to see full cast list at the end. Utterly charming and delightful. Everyone was first class. A truly magical evening. Drosselmeyer, Nutcracker, the Prince - perfection! And an exquisite Clara! Wonderful production. And we applauded! Another magical evening! Love the new Steven McRae and Sarah Lamb partnership! Clara was beautifully portrayed but is there a need for her and Hans Peter to join in every dance? Darcy as always set the scene so well. A fine partnership, agreed, but Lamb and McRae have been dancing together for years. I love that fact that Clara and Hans Peter join in the Act 2 variations. It binds the fantasy together and makes Clara even more central to the story. Wonderful evening. Truly magical. Letchworth, Herts. Loves every single minite of it. We have been watching from Duisburg, Germany. Thank you so much for a perfekt ballet night! Truly wonderful. This production surpasses all others. Brilliant. Christmas has begun. @ROHnutcracker performance was absolutely wonderful. Sarah Lamb was spectacular as always, she danced beautifully. I'm looking forward seeing her in more plays. Every time I see the Nutcracker is pure beauty. Brilliantly moving production! The company, the beautiful costumes and sets, perfect to start our Christmas joy! Fabulous ballet. Wonderful cast and principal dancers. Music and costumes and staging superb. Magical evening . Viewed on live stream in Antrim, Northern Ireland. Real treat. Thank you and Merry Christmas to you all at ROH. Magical evening! What a complete delight from start to finish! Definitely the start of Christmas! Huge congratulations to all the performers and to the wonderful orchestra! Thank you all! First time seeing the Nutcracker. What a fantastic performance ... was out of breath myself watching the dancers. Truly magical. An immaculate performance - enhanced by the obvious pleasure of the dancers! A real life-enhancing experience. Stunning performance from everyone involved - just magical. Absolutely stunning! Joy to watch! Wonderful, wonderful evening. Thank you so much, I'm without words, still 6 ft in the air! Stunning mesmerising ballet , wonderful dance harmony to music. Thank you to ROH for making it possible to watch in the Algarve. Fantastic from first to last. The whole cast was excellent a d held us spellbound. Wonderful to see Casper and his colleagues performing so beautifully and the senior dancers providing them with such amazing examples. An absolutely magical evening. Sets amazing, dancing stunning. Costumes exquisite. Christmas present from my lovely neighbours. Fantastic start to Christmas. Pure perfection. The best performance I have seen to date. Christmas can now begin. It was truly magnificant. The production was disappointing in terms of staging. The backgrounds were simplistic and rather drab, which detracted from the excellent costumes. The dancing itself suffered from first night nerves on occasion, but was mostly of a high standard. Frankie - beautiful, expressive dancing and a delightful partner in Alexander. Steven McRae was superb and the rest of the cast just made it a magical evening ! Just back from a magical evening watching Nutcracker.....we saw so much more than we ever did sitting in the Upper Slips! Sarah Lamb and Francesca Hayward were just perfect.....as were Stephen McRae and Alexander Campbell.....both such elegant dancers. I introduced my wife to the nutcracker this evening and gladly she loved it. Fantastic opening night! Sooo disappointed! The live cine screening of The Nutcracker had no sound during interval discussions and during Act II, so we were refunded the cost of the cine ticket at the Box Office, Cineworld, Bolton, Lancashire UK. Thank you for getting in touch. We are sorry to hear that the interval discussions and Act 2 were without sound at the screening you attended last night. We will contact the venue concerned to find out why this happened, and consequently resolve the issue in the hope of preventing such occurrences in the future. A magical evening. Phenomenal production with excellent commentary from Darcy and Petroc. Thanks to the dancers and orchestra. There are not enough superlatives to describe this performance. ..it's pure genius ..in every detail ..
We have seen it from Spain. It was outstanding. The dancers were light, melodious, delicate. The music, superb. Enjoyed it but disappointed with colour I thought the costumes and tree were dull in the first part. The colour second half much better. An enchanted evening - just wonderful. The view of the production in a cinema is amazing - we were mesmerised from start to finish. Thank you so much! Christmas comes with nutcracker cheer to my eyes it brings always a tear, with glitter and magic and talent galore we could not move and wanted more! you did not fail you always deliver, the snowflakes fall and make us shiver....then on we go to land of sweets where dreams are made and full of treats, the music the setting the costumes the ball so very enchanting to big and to small. Sadly it comes to a magical end and we wait for next year and our nutcracker friend. Now it's Christmas! !! We've been magically transported to the lands of snow & ice, sweets & flowers and have been enchanted by the stunning dancers of the Royal Ballet. All the principals were fantastic - beautiful partnership of Sarah Lamb & Steven McCrae. Steven showed how versatile he is from a previous role as Frankenstein to Nutcracker's handsome Prince & just effortlessly leapt his way into our hearts. Amazing performance, beautiful music. As someone who never has the opportunity to watch Ballet at ROH the live stream cinema screening is a god send .The beauty and the magic is not lost in the cinema and last nights performance of the Nutcracker was breathtaking...just pure magic....i live on an inner city housing estate and this was just like stepping into a magical world....Bravo to you all !!! Great to see Sarah Lamb back in her perfect so delicate dancing action. Well that was a truly magical Opening Night! Christmas wouldn't be the same without your Nutcracker. Fabulous production, amazing artists, and the costumes are just so gorgeous. Sarah Lamb as Sugar Plum with her Prince Steven McRae were impressive, Francesca Hayward/Clara and Alexander Campbell/Hans very sweet, and Yasmine Naghdi as Rose Fairy was sensational. All the dancers involved deserve great credit for their individual and/or group performances (those Angels! the Snowflakes!). Thank you RB for giving your audience such great beauty. Merry Christmas to you all. Clara was mesmerizing. The corps the ballet is also a delight to watch. Especially Romany Pajdak danced wonderful. We enjoyed the show last Evening in Almere Netherlands. Great to see this in our hometown ! We will continue to follow the ROH. Brilliant in all respects but what happened to the mouse king rising up from the floor in a cloud of smoke? Or did I nod off? Spell binding, a breathtaking exquisite performance form everyone, congratulations. Fantastic, beautiful and magical. Those jumps/turns/lifts. The second half runs through apace, so much to comment on! Let's not forget our very own Gary Avis holding it all together! Seen at 'Live From' so although not there we get those close ups, a marvellous event if you can't get there and sit in the 'gods'!! Francesca and Alexander are a brilliant partnership in a wonderful production. Would have liked to see brighter lighting on stage. I found it rather dull particularly in Act 1 and on the Christmas Tree. Enchanting in every way! Gary Avis was the perfect blend of charm, wit and cloak-swishing magic as Drosselmeyer. Heart-warming performances from Clara and Hans-Peter, and sparkling magic from Sugar Plum and her Prince. Beautiful performances all round, to gorgeous music. What could be a better start to the season? My first experience of ballet and it won't be my last. The Nutcracker is utterly magical. I was totally entranced by the whole performance not least the fantastic skills of the wonderful dancers, Tchaikovsky's amazing music and the fabulous sets. The Nutcracker was ruined for us as the cinema (Showcase Cardiff Nantgarw) showed it at the wrong ratio - all the dancers looked short legged and very broad with flattened heads. We brought this to the attention of the staff during the introduction and again during the interval but they failed to get it right. Enjoyed the music! Thank you for getting in touch with us about this. We are sorry to hear that the screening you attended experienced the wrong aspect ratio. We will contact the cinema concerned to properly assess and diagnose this issue, in the hope of ensuring that such problems are not encountered during any future broadcasts. I do agree Miss Yasmine Naghdi deserved being mentioned on the cast sheet last night, and especially as she is a Principal. I heard a bunch of people around me asking "WHO IS the ballerina performing Rose Fairy?" As a ROH regular I told them once the screening had finished who she was. Those responsible for putting the cast sheet together for the cinema screening should know that non-regulars want to know the names of the dancers. Also it is showing respect to your dancers AND Principals! Last night's performance of the magical Nutcracker was better than ever!! It was brilliant, Clara, Sugar Plum Fairy, her Prince - and all the other characters not forgetting the enchanting Arabian slave girl who was fantastic - were danced to perfection. Thank you so much EVERYONE. I love this production and will be seeing it at ROH next week. It is so good that it can be seen and enjoyed by so many in other countries as well as by those who are unable to see it in London. It is a different experience but so worthwhile. Surely the relatively dark Act 1 lighting acts to set off the costumes and focus attention on the dancers, although there is, I believe, a technical difficulty to do with the dynamic range of today's digital cameras, meaning that the experience of the live audience would be affected by unnecessary brighter upstage lighting. An explanation of this and other screening matters would be welcome, online or in the Friends' magazine. I think I am right in saying that the Mouse King's arrival has not been by trapdoor since the stage was re-built, but it can be seen in one of the older videos. Sadly I didn't actually see it last night. The screening at Nantgarw was so poor that I left rather than sit through over two hours of a picture which was set at the wrong ratio and badly adjusted.. The manager explained that they had a new receiver/projector which gave only two ratio options, one of which was simply a smaller version of the erroneous original.If I understood him correctly he started to imply that it was transmission and out of their control but I pointed out that his competitors in the area had (usually) perfectly acceptable picture quality.The picture itself goes grey rather than an attainable black, thereby losing so much detail. I liken it to a bad picture on a cheap supermarket tv rather than an excellent ROH bluray on a quality, well adjusted tv. I have had this conversation with them before, to no avail. I was happy to compliment him on his generally high standard of presentation (houselights at the right time etc ) but suggested that it lets the public down not to be technically efficient too. He mentioned some problem about having to staff so many performances in the multiplex and not being ablt to afford trained technicians on duty all the time. He was very reasoable and it will not put me off going there provided that he does sort out the quality issues. Maybe the ROH team could apply pressure and expertise from above! By the way it was good to see, momentarily, Darcey more at ease with an accomplished broadcaster at her side, following the example of quality opera presenters. Lots more please. Happy Christmas to all. We are sorry to hear about the technical problems you encountered last night. Thank you for your comprehensive account of what happened - having taken this information on board, we will discuss further with the cinema the cause of the issue in order to make sure it does not happen again. We hope you enjoy your time at the production next week at the Royal Opera House. I absolutely loved this performance beamed to a packed auditorium here at the Vue cinema in Stroud, Glos. The dancing was exquisite, the costumes and staging amazing and the music wonderful. I was quite transported and even shed a tear at the end when Drosselmeyer’s nephew is restored! A beautiful, magical performance! Thank you so much to everyone involved for a wonderful evening and also to the ROH for these cinema relays which are a joy to us living 'in the sticks'. Was I dreaming, or was the final scene with Clara awakening and glimpsing the ‘real’ Hans-Peter missed out? Coming back this year! Wish to be there every Christmas! Thank you for sharing with us all the Magic! First time ever visit to live screening, it was magical. The music, the costumes, the scenery were captivating, I already knew the music so well and had seen some of the ballet on tv but this was magnificent. What a fantastic evening the dancing was amazing and our “best seats in the house“ certainly gave us a wonderful view of everything. Will definitely not be my last visit to a live screening, cannot wait until the next one. Thank you for your response, Lloyd. Here's to a "clean" Rigoletto next year. Enjoyed my annual treat of The Nutcracker once more in Rochdale. last night. McCrea and Lamb excellent although not my favorite sugar plum and prince. I agree the lighting on stage was a bit dull. Hayward and Campbell superb, even better than last time, Wish I could see them as Sugar Plum and Prince. Orchestra magnificent. I agree I would like to find full cast list - I like to track dancers progress over the years. Last wish - someone else instead of Darcey - am I alone in this. Thank you Royal Ballet for nights at the cinema, just wish there were more so what about Sylvia soon. Absolutely incredible - and the live screening was so much better than expected. Even in close up the lifts look so effortless and the detail of the costumes was stunning. I also enjoyed the backstage moments with dear Darcey - though she does need to practice handling a microphone ! A superb Nutcracker last night - watched in a packed cinema in Southern Spain. I was especially impressed by Yasmine Naghdi as the Rose Fairy, and the Colombine doll, I think danced by Elizabeth Harrod. But PLEASE, PLEASE could you put a complete cast list on the web site? The cast comes up so fast on the screen that it is impossible to take in and remember everybody. Hello Felicity - I always want the full cast list too as I like to see dancers take on increasingly major roles through the years. But on visits to my cinema we are given an A4 Programme sheet which has a link for a digital programme on it. Just sent for mine. Give it a try if your cinema does the same. If not ask them why not. Hope you enjoyed it as much as I did and have just watched again my DVD of last years showing. Still wonderful. Absolutamente fantástico, emocionante y muy bonita puesta en escena. Truly captures the magic of imagination with a wonderful music score. Bravo ! Fantastic and captivating performances by all concerned"..wonderful score.Bravo. Well, I can't comment on what was or wasn't shown in cinemas, but writing as someone who was in the house itself, a) the Mouse King most certainly does still arise through the floor on a lift in a plume of smoke, and b) Clara does indeed both wake up in the deserted room, and then runs into the newly-restored Hans-Peter out in the street where he's looking for his uncle's place. Thank you so much Royal Ballet for putting these screenings on - they are an amazing way to improve access to ballet and continue to grow the potential audience. Really loved Francesca and Alexander and Steven however I prefer someone like Hayward as the Sugar Plum Fairy. There has not yet for me been anyone that has surpassed Yoshida in the SPF role and I still miss seeing her. Overall fab production but I agree with other comments re act 1 - it feels a bit crowded and messy. Altogether very magical and evocative of Christmas so thank you for putting it on. Enjoyed this however the cinema (odeon aylesbury) is a bit old so the sound wasnt great and it was too hot. I love this concept of streaming live events, I wish they would do it with more family friendly events such as musicals (wicked, lion king etc). The current offering is very high brow (ballet, opera, shakespeare). Thank you very much for a magical night. I have seen it from Rome (Italy). It is so special to have the opportunity to see this beautiful show from far away with this affordable price! Thank you to all the performers, dancers and musicians, workers behind the stage I was so impressed, the ballet really moved me. I was expecially moved by Sarah Lamb: she has a gentle smile during all the performing, the smile blossomed after each tour or difficult pose. Absolutely wonderful. I generally go alone, but this time I took 4 friends with me and we were totally enthralled. One friend had never been to the theatre before, but can't wait to go again. We saw it in Theatre Severn, Shrewsbury. I shall be getting the DVD so that I can relive it all. When can the rest of the world see this performance please? I would dearly love to see Frankie and Alex performing Clara and Hans Peter. I've watched them rehearsing as the Sugar Plum Pair on YouTube and find them refreshing and endearing with a lovely chemistry that makes you want to watch them for hours. And their feet! Both of them! (Should that be 'all four of them?') Remarkable! I'd also like to see Steven McRae and Sarah Lamb in the Sugar Plum roles. I often find them rather scarily too perfect and much better suited to more 'adult' roles (such as the couple in 'Rubies'). A friend of mine was told that your website indicated that the View Cinema in Romford was showing this streamed performance last week. When she went to the cinema to book tickets the staff there denied all knowledge of the performance. Was she misinformed or had the staff there got it wrong? I ask because she was very disappointed as she had intended to go with a friend. She has difficulty travelling on public transport and this cinema is virtually on her doorstep She has said that when she has been to that cinema in the past to book streamed performances by the Royal Ballet the staff seemed to know nothing about them and denied all knowledge of their existence. She has also said that there was never any publicity about these performances at the venue. Has that cinema given up showing streamed Royal Ballet performances because of low audience numbers? If it has then are your venue details correct? Thank you for getting in touch. We can confirm that the cinema concerned did show The Nutcracker live on Tuesday 5th December 2017, and will be screening the rest of the ROH Cinema Season live. Please follow the link below for the screening dates and times for the cinema in discussion. First time of seeing Nutcracker - utterly magical! Loved, loved, loved it! Now I have seen Hayward and Campbell as Prince and Sugar Plum via my recording device! And lots more too in the programme Dancing the Nutcracker. Loved it - sometimes I think I even prefer to see the rehearsals over the performance. Have also re-played my four DVD's of this ballet one after the other. Really interesting to track all the minor changes from first one to the last Dowell to McCrea no less. The two Royal Nutcrackers still make more sense than any other I have seen or posses on record. So grateful for these cinema relays as I can no longer access live performances in theatre. Looking forward to next years shows already. If anyone missed the TV show I mentioned it is on again over Christmas, check your perogrammes. I've seen the Nutcracker 4 times over the past 4 years - once in House and thrice via DVD / TV. The latest instalment seemed a bit odd and I thought it was just me, but the Chinese Dance absolutely confirmed that some changes have been made. I have to say that I prefer the original version - it flowed much smoother and came across sharper and on point. It's truly magical and 100% perfect, so why make tweaks? Saw the 18 Dec show- absolutely magical and brilliant, delightful performances from all the cast, which included Hayward (Clara), Campbell (Hans Peter), Avis (Drosselmeyer), Nuñez (Sugar Plum Fairy), Muntagirov (Prince), Choe (Rose Fairy). The ROH Orchestra gave a glorious rendition of Tchaikovsky's beautiful score and the stage crew's handling of all the various tree, snow, etc effects were just stunning. We enjoyed the changes that Sir Peter Wright made to his celebrated production last year, namely the updated (and to echo Sir Peter's opinion, improved) choreography. I still remember his first version of this Nutcracker in the 80s and while that was very good, this is now truly magical. Thank you Sir Peter, dancers, RBS students, musicians, stage crew, coaches and everyone involved. What a treasure! Sorry, left out 4 words: "choreography for the Chinese dance." I have just seen it yesterday in Japan. The best nutcrackr I've ever seen. I loved the every moment. I loved the Hans Peter dancing with the Russian Dolls. I wish to see it live. Christmas began tonight watching The Nutcracker live cine recording. Fabulous production, staging, dancing, artistry, music....I could go on and on, truly magnificent! Well done to you all, thank you. Bravissimo! A truly world class production - the standard in all aspects of presentation, execution and just pure magic, left me overwhelmed. Traditional is still best when done to this level of achievement. We looked forward to seeing the ballet as advertised at Harbor 9 Cinema, Annapolis MD in July. We were most frustrated in calling the theatre and searching on-line for a showing. What happened? The cinema in October had no idea what we were talking about and we never saw another ad or link after frantically searching for 3 months. So disappointed for us (wife and me) and for whole family who wanted to experience this extraordinary show. You Think this production is good ?You should see Sir Peter Wright's production for Birmingham Royal Ballet. That will blow your mind,try and catch it At The Royal Albert Hall,You will not be disspapointed.